A defining figure of contemporary art, Rauschenberg produced a prolific body of work across a wide range of media — including painting, sculpture, drawing, prints, photography and performance — frequently and fearlessly defying the traditional art practice of his time. Robert Rauschenberg: Erasing the Rules marks the first retrospective of the artist’s work in nearly 20 years, celebrating the depth and scope of his six-decade career. SFMOMA’s presentation emphasizes his iconoclastic approach, his multidisciplinary working processes and frequent collaborations with other artists. Largely organized chronologically, the exhibition begins with the artist’s wide-ranging early work, from bold blueprint photograms and intimate photographs to his delicate Scatole personali (boxes filled with found objects). These galleries introduce Rauschenberg’s eagerness to experiment with and break from artistic conventions, his innovative approach to materials and his multi-disciplinary and collaborative nature, all of which were driving forces throughout his career. This early period plays out across three locales: Black Mountain College, a fertile ground for experimentation where Rauschenberg studied with Josef Albers and Hazel Larsen Archer, and undertook his first important collaborations with Susan Weil, Cy Twombly, John Cage and Merce Cunningham; North Africa and Italy, where Rauschenberg traveled with Twombly; and lower Manhattan, where he set up his early studios and worked in close dialogue with Jasper Johns. Among the many highlights of the exhibition is Automobile Tire Print (1953) in SFMOMA’s collection, made when the artist instructed composer John Cage to drive his Model A Ford through a pool of paint and then across 20 sheets of paper. The layered paper and fabrics in his Black paintings and Red paintings led to the artist’s landmark Combines (1954–64), a body of work that breaks down the boundaries between painting and sculpture. 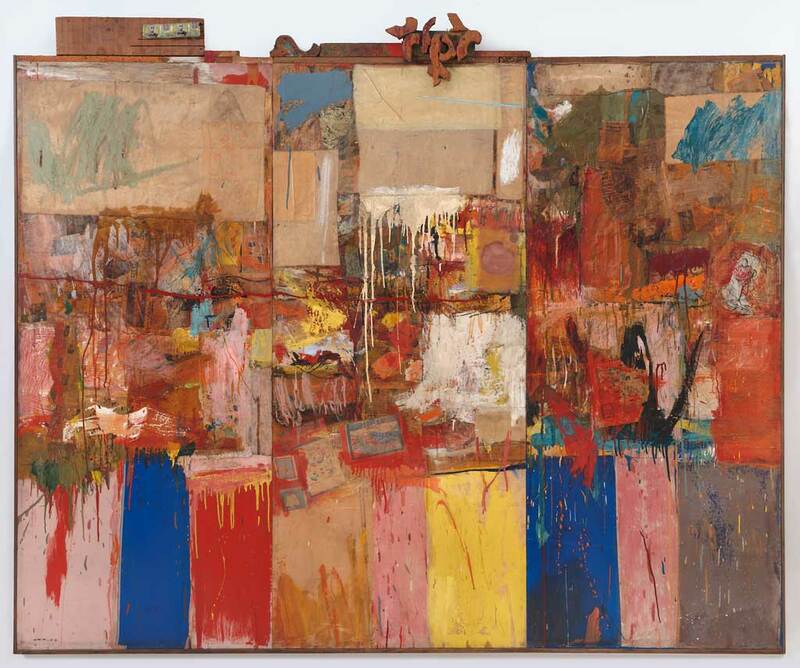 and Charlene (1954) are presented together for the first time in almost four decades, providing a rare opportunity to see and compare the range of strategies Rauschenberg explored in the Combines’ formative stages. Monogram (1955–59), his landmark work assembled from a taxidermied goat with a painted tire around its body, anchors this presentation. Thirty-Four Illustrations for Dante’s Inferno (1958–60), Rauschenberg clipped pictures from magazines and newspapers, illustrating Dante’s epic poem with images from contemporary American life. 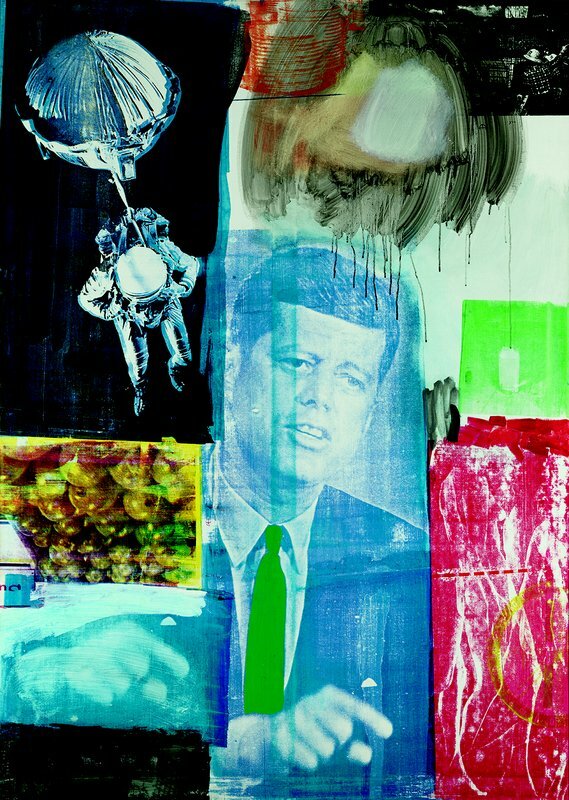 Rauschenberg’s merging of classical themes, art history references, contemporary politics and pop culture culminate in the silkscreen paintings, such as the vibrant Scanning (1963) and Persimmon (1964). 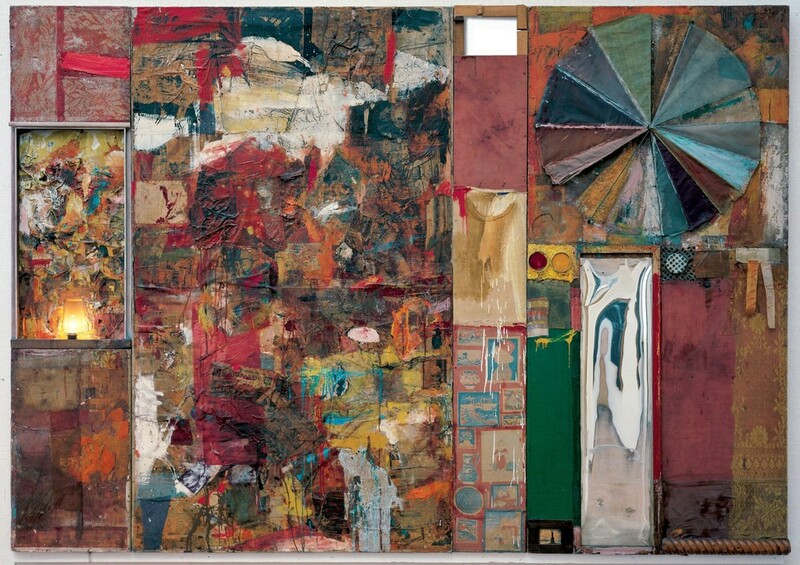 Rauschenberg also actively explored technological innovations for his performances and artworks in the early 1960s. Collaborations with Billy Klüver and a team of engineers lead to the inclusion of embedded radios in Oracle (1962–65). For the sound-activated work Mud Muse (1968–71) the artist constructed an enormous vat of vigorously spurting and bubbling mud. Originally conceived for an exhibition in Los Angeles and inspired by a hydrothermal basin in Yellowstone National Park, this presentation marks Mud Muse’s first return to California since 1971. In 1970, Rauschenberg relocated his primary residence and studio to Captiva Island, Florida, where he lived and worked for the rest of his life. These new surroundings prompted the creation of the series Cardboards (1971–72). 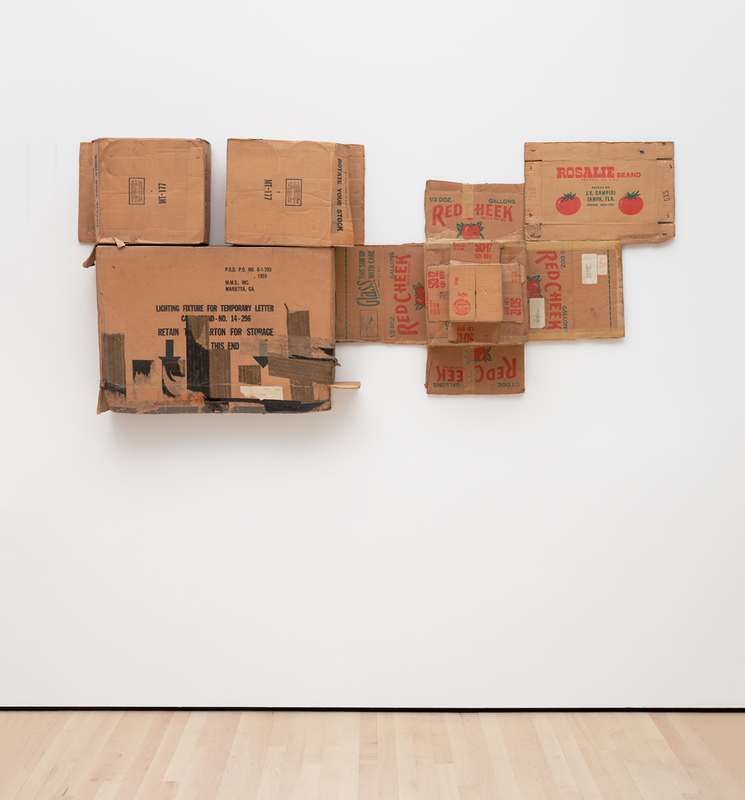 SFMOMA’s Rosalie/Red Cheek/Temporary Letter/Stock (Cardboard) (1971), one of the earliest of the series, encapsulates this move with a mailing label from Rauschenberg’s New York studio to his Captiva address affixed to its front. SFMOMA’s Port of Entry [Anagram (A Pun)] (1998). The exhibition culminates with Rauschenberg’s late work, including his series Gluts (1986–94), assemblages of scrap-metal that point to the excessive consumption of American society, yet also incorporate humor. The artist’s metal paintings of the 1990s, such as Holiday Ruse (Night Shade) (1991), feature subtly layered images silkscreened onto sheets of aluminum and bronze with tarnishing agents. The color transfer paintings of the 1990s and 2000s employ photographs printed with environmentally-friendly inks via cutting-edge digital printers and image-editing software, a testament to the artist’s ongoing embrace of emerging technologies and materials. Born in Port Arthur, Texas, Robert Rauschenberg (1925–2008) was creative from a young age, and active in school theatre as a costume and set designer throughout high school. He attended the University of Texas, Austin, before he was drafted into the United States Navy. After his honorable discharge in 1945, he studied at the Kansas City Art Institute and the Académie Julian in Paris, France. Later he attended Black Mountain College in North Carolina, where he studied with Josef Albers, among others. 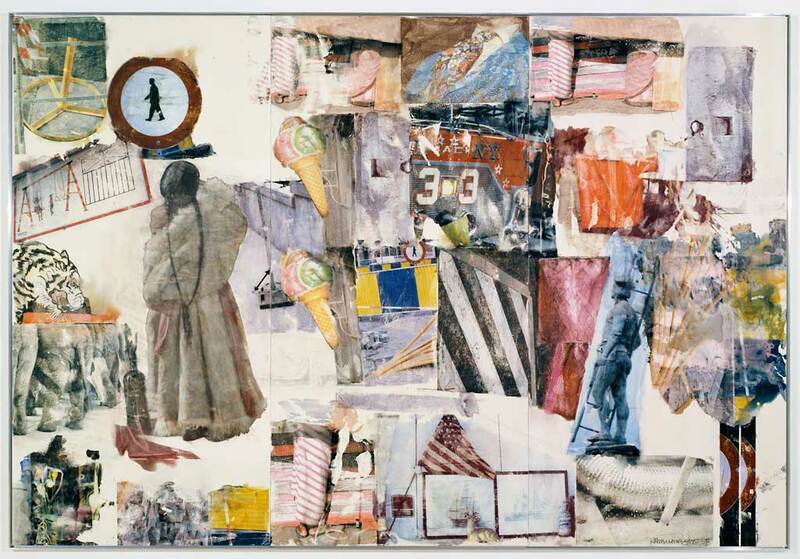 Rauschenberg launched his artistic career in the early 1950s, during the peak of Abstract Expressionism. Challenging this painterly tradition with an egalitarian approach to materials, he brought objects and images from the everyday world into his art. Working alone as well as in collaboration with artists, dancers, musicians and writers, Rauschenberg invented new interdisciplinary forms of artistic practice that set the course for present day art. He developed new modes of performance work, organized collaborative projects that crossed the boundaries between different mediums and different cultures and created works that merged traditional art materials with ordinary objects, found imagery and the cutting-edge technology of an emergent digital age. Major exhibitions include Robert Rauschenberg: A Retrospective (Solomon R. Guggenheim Museum, 1997); Robert Rauschenberg: The Early 1950s (Menil Collection, 1991); Robert Rauschenberg: The Silk-Screen Paintings, 1962–64 (Whitney Museum of American Art, 1990); and Robert Rauschenberg (National Collection of Fine Arts, 1976). Rauschenberg’s work took him throughout the U.S. and across the globe, including Central and South America, Asia, Europe and Africa. From 1970, he worked from his home and studio on Captiva Island, Florida. Robert Rauschenberg: Erasing the Rules is accompanied by a richly illustrated catalogue, which examines the artist’s entire career across a full range of mediums. Edited by Leah Dickerman and Achim Borchardt-Hume, the book features commissioned essays by eminent scholars and emerging new writers, including Yve-Alain Bois, Andrianna Campbell, Hal Foster, Mark Godfrey, Hiroko Ikegami, Branden W. Joseph, Ed Krčma, Michelle Kuo, Pamela M. Lee, Emily Liebert, Richard Meyer, Helen Molesworth, Kate Nesin, Sarah Roberts and Catherine Wood. Each essay focuses on a specific moment in Rauschenberg’s career, exploring his creative production across disciplines. Integrating new scholarship, documentary imagery, and archival materials, this is the first comprehensive catalogue of Rauschenberg’s career in 20 years.